Connecticut Workers Compensation law includes injuries stemming from work site accidents due a multitude of causes. Given the presence of potentially dangerous equipment, premises issues, and strenuous work conditions there are many ways to become seriously injured. 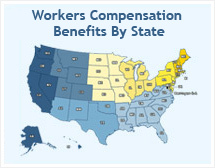 Connecticut's system of workers compensation is compulsory, meaning that employers are required to provide worker's compensation insurance for their employees. Worker's compensation insurance may be provided through a private insurance carrier, or employers may self-insure. Waivers are not permitted. No compensation is payable for total or partial incapacity of any injury which does not incapacitate the injured employee for a period of more than three days from earning full wages at his customary employment. If the incapacity continues for a period of more than three days but less than seven days, compensation will begin at the expiration of the first three days of total or partial incapacity. If the incapacity continues for a period of seven days, compensation will begin from the date of the injury. The injured employee is entitled to full wages for the entire day of the injury and that day will not be counted as a day of incapacity. If the employee is entitled to receive compensation for permanent disability to an injured member in accordance with the provisions of subsection , the compensation will be paid to him beginning not later than thirty days following the date of the maximum improvement of the member or members and, if the compensation payments are not so paid, the employer will, in addition to the compensation rate, pay interest at the rate of ten per cent per annum on such sum or sums from the date of maximum improvement. The employer will ascertain at least monthly whether employees are entitled to compensation because of a loss of wages as a result of the injury and, if there is a loss of wages, will pay the compensation. The chairman of the Workers’ Compensation Commission will adopt regulations, in accordance with the provisions of chapter 54, for the purpose of assuring prompt payment by the employer or his insurance carrier. There is no single worker’s compensation benefit package. Benefits are determined for each person based on how they got hurt. Most benefit packages involve some type of wage replacement and medical care, but they can also include other things that help you take care of yourself during and after your injury. Some different types of worker’s compensation benefits include replacement of all or some of the wages you would have earned if you weren’t sick or injured, if you can’t return to work, if your new job pays less than your job before the injury, of if you can’t work because of a scar or disfigurement. Also, job retraining and help finding a new job if you stop doing the type of work that caused your injury. Replacement or repair of your glasses, hearing aid, contact lenses, or artificial limb and all medical bills for your injury or illness should be paid by your employer or the worker’s compensation insurance company. You should never receive a medical bill. All prescriptions given by your doctor as treatment for your injury or illness are fully covered by worker’s compensation insurance. Your employer must provide or pay for transportation to go to and from your medical treatment. The employer should pay for an ambulance or taxi or repay you for the mileage if you drive your own car. You should keep a record of each visit’s date, location, cost or mileage to send to your employer or insurance company. An employer cannot discharge or discriminate against you just because you filed a claim for worker’s compensation benefits. NOTICE: These questions and answers concern Connecticut law only, and should not be construed nor relied upon as reflecting the law in other States, nor as giving legal advice. You are warned that circumstances often vary greatly and that, due to changing decisions and law, the answers to these questions may change over time and not be current, and you should consult an attorney in any specific case, and NOT rely on these questions and answers as giving anything other than general information. Disclaimer: THIS IS AN ADVERTISEMENT. Advertising is paid for by participating attorneys and advocates. The site is not an attorney referral service. WorkInjuryBenefits.net name is privately owned and is not affiliated with or endorsed by the U.S. Department of Labor or any other federal or state government agency. The promotion of this website is sponsored exclusively by professional Workers’ Compensation Attorneys and Advocacy Groups, in effort to provide services to the public for workers’ compensation and injury issues.